Another popular model designed for larger kitchen spaces. And if you like the “rectangle” look but your space is just a bit too small for a full-size 34” rack, this model can also be assembled at 24” length. 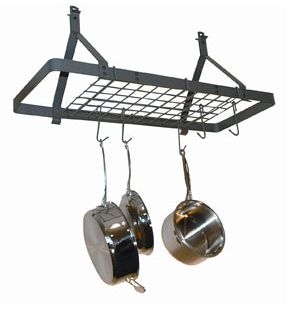 Spacious and extra functional, this rack features 12 pot hooks and holds lots of pots! The grid (included) multiplies the storage capacity and versatility of the rack (grid fits 24” and 34” sizes). Especially designed for homes with smaller kitchens, also condos, town homes and apartments. Very versatile because you can assemble it 24" or 34" long to fit a variety of spaces.